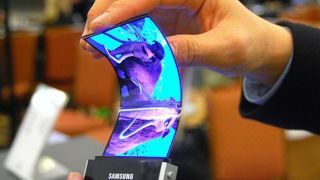 There's every chance that smartphones of the future will have folding screens. The tech has been under development for a long time and we're already seeing curved displays on the likes of the Samsung Galaxy S7 Edge, so it seems like it will only be a matter of time, but when it does arrive we hope it looks nothing like it does in this Samsung patent. Unearthed by Patently Mobile, the design shows a phone which when unfolded looks like any other Samsung handset, complete with rounded corners, an oblong home button and a camera jutting out the back. And unlike some folding concepts, which always give you access to the screen and just make it bigger or smaller depending on whether it's folded, this Samsung one cuts the screen off altogether when it's closed, leaving you with a useless and likely very expensive lump. In another bizarre twist the charging port lives on the joint, so you can only charge the phone when it's folded shut, meaning you can't both charge the device and use it at the same time. It reminds us of a recent Oppo flip phone prototype, except it's even worse, as that you can at least charge while using. We're all for folding phones and even the return of flip phones, but not like this.